A lot has changed in the world of computer storage in the past decade. Traditional spinning hard disk drives (HDD) have been outperformed by insanely fast and now affordable Solid State Drives (SSD). And now we have insanely faster flash memory technology already available for the consumer market in the shape of Non-Volatile Memory Express (NVMe), which is manufactured in a number of different interfaces / form factors, including M.2. Many photographers, including myself, experienced a huge boost in performance for post-processing large resolution files when switching from a hard drive to an SSD, but now that the faster flash memory is becoming more common, one might be wondering about the benefits of this new storage compared to both HDD and SSD drives. We have already published a detailed article on building a computer for photography based on the latest generation Intel Skylake architecture, where we recommended to get the new generation motherboards with built-in M.2 slots for flash storage. Having built a similar computer myself for my post-processing and video editing needs, I thought it would be useful to share just how much faster the new storage is compared to both HDD and SSD drives, since I use all three in my large full tower setup. Many photographers still actively rely on hard disk drives, since they not only give more bang for the buck when compared to other storage types, but also provide a lot more storage to work with. And considering that photographs and video take enormous amounts of storage space, it is given that HDDs would be far more popular in comparison to everything else. When buying a brand new laptop or a computer, it is tough to decide what to go for – a much smaller, but faster SSD / PCIe flash memory, or a large capacity hard drive. And what makes it even more confusing, is that we now have hybrid hard drives, also known as “Fusion” drives, which are supposed to give the benefits of both SSD and HDD storage in a single package. What is the best storage type for photography needs? Such questions are very common among photographers, who try to plan their storage needs when shopping for new hardware. Unfortunately, there is no single right answer for everyone, because it all depends on each photographer’s workflow and how much storage is needed. For beefy storage environments with tens or even hundreds of thousands of RAW images and videos, no single type of storage would be sufficient, because there would most likely be two environments in place – one for current active projects (fast storage) and one for passive projects / archival (slower, large capacity storage). For smaller environments, a fast flash drive with a combination of either internal or external hard drive would suffice, where the photographer would place their operating system files, along with their active image catalog on the fastest flash storage, while storing images in slower, large capacity hard drives. And for someone who is starting out, a single, do-it-all drive would most likely suffice, with storage type depending on budget. For my personal and business needs, I have been heavily relying on SSD and HDD drives during the past years, some of which are placed in my computer, while others are a part of a large Synology storage array. With 10+ years of images and the various video projects that I am currently working on, storage has been a very essential and integral part of my workflow, as I need to re-address both capacity and performance needs every few years. The main reason is time – if I can save hours of my time by using faster storage, it translates to more efficiency for the entire workflow. And I am not just talking about pure editing time, as storage is used for other critical parts of workflow, such as backup, as well. In just read performance alone, my M.2 drive turned out to be a whopping 25x times faster than my enterprise-grade WD 2 TB 7200 RPM drive. That is just mind boggling, considering that SSD is only around 5x times faster in comparison. In write speed, I was able to witness up to 15x more performance, which is also a very impressive number. And that’s just for one type of sequential read/write load – if you look at the above numbers, other performance metrics indicate even larger, more noticeable gains. What does this all translate to? With so many camera manufacturers pushing for more resolution, many of us have been experiencing performance issues, with storage often being the bottleneck. If one can place their image catalogs on the fastest drive and use faster drives for storage of RAW images and video footage, the performance gains can be tremendous, especially during intensive workloads such as image and video export. And once file copy / move operations are involved, those benefits can become even more significant, especially for a busy professional. One thing to note – I am not suggesting that one would experience 25x performance gains just by switching from a hard drive to a flash drive when editing images, since there are many other factors involved, such as overall speed of the computer (CPU speed, number of CPU cores, total RAM and its speed, etc), the ability of the software to take full advantage of both the computer resources and the storage, etc. The software numbers from the above benchmarks might not apply the same way for everyday work. Hope you found this article useful. If you would like to find out more about storage and workflow needs, we covered these topics in more detail in our Level 1 Workflow and Post-Processing Course. What is confusing is that there are different types and speeds of NVMe. For instance this Dell latest 13xps that I’m nicely typing on from the convenience of my easy chair, has a slower type of NVMe. It seems to be doing fine even when ingesting photos into Lightroom at full resolution. But if I had known what to look for, I might have gone with the 15xps which evidently has a faster NVMe. I will be more careful in the future! Jay, yes, there are so many different storage types and speeds, that it can be indeed quite confusing. Another factor is size – generally, larger size NVMe devices will provide faster speed, since there are more simultaneous reads and writes possible. NVMe is only an interface specification. It says nothing about the actual speed of the drive but rather of the theoretical limit of the devices used on this interface. CrystalDisk Mark or AS SSD results are what you’re looking for and reviews are widely spread on the internet. Hmm, I don’t think this comparison is very informative. The advantage of SSDs over HDDs were not about sequential workloads, but about random workloads. Yes, reading NEF files does take some bandwidth, but processing them will eliminate the difference there—just looking at sequential performance where even a slow HDD can read 2+ NEFs per second is not the most useful. 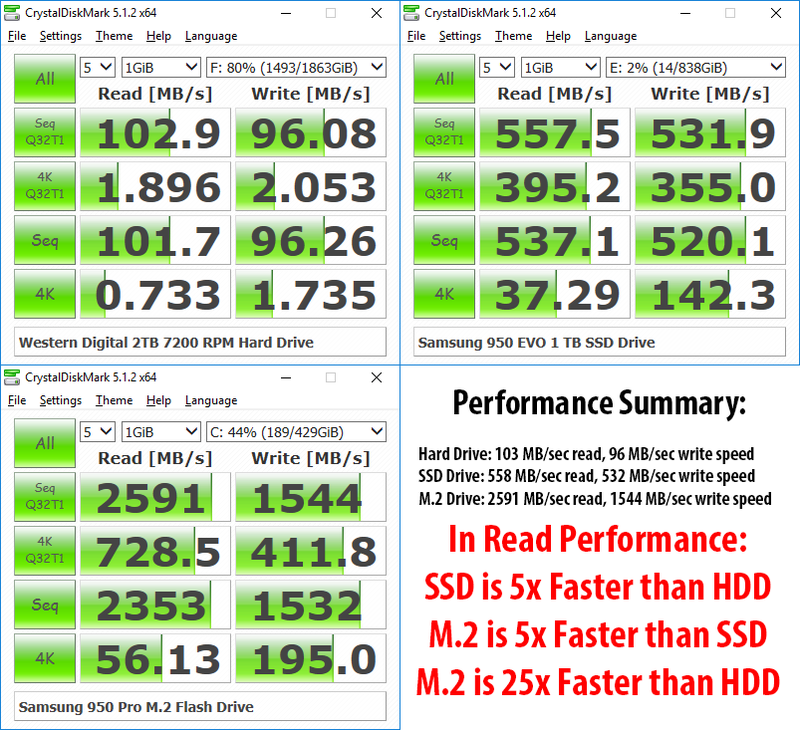 Where SSDs shine is random read/write: at 4K, SSDs in your example have 50× read speed and 82× write speed over HDDs. NVMe only improve this by 1.50× and 1.37×, since very small reads/writes are memory technology dependent and not bus (approximately). Lustin, I agree with most of what you have said, particularly in regards to SSD being so much better at random IO than an HDD, making them a far better choice in comparison. However, I do not agree that an HDD would be sufficient just because it can read 2+ NEFs per second – that all depends on what the person is trying to do. Doing exports, merging panoramas, working with 600+ MB TIFF files in Photoshop and doing other similar workloads put quite a bit of strain on storage, making the differences between an HDD and an SSD quite noticeable. I agree with your conclusion, but need to think about how to present that to someone who has no idea about the storage technology. I tried to write it as best as I could in the simplest language possible. Nasim, if you want the simplest message, I’d say something along these lines: the move from HDDs to SSDs is a real game changer. Minimum speed-up is 5×, maximum around 50×. The move from SSDs to NVMe is an incremental change, around 5×, which is much less than HDD→SSD. Lustin, I disagree with your suggestion to rewrite Nasim’s conclusions because all operating systems use an ever-changing (via software updates) kernel-level disk caching algorithm. This algorithm utilises the unused system RAM to buffer multiple disk write requests, and to cache both the most recent and the most frequent disk read requests. Benchmarking software produces results only for its very small set of specific tests conditions, which rarely align with either the requirements of photographers or the diverse range of, and ever-changing, algorithms used in image editing software. Very nice article Nasim. Even though I use an Apple MacBook Pro (mid 2014) I’ve always wanted to build a nice and powerful machine for photo editing and I saved this article for future reference. Do you have an article with video that could go step by step on how to perform a build like the one you described. That’ll be real nice. Thanks again for such an informative article. I also have a Macbook Pro 2014, in which I have installed a 1TB SSD. It was easy to do and the SSD cost me NZ$700 and has made my Mac much faster. I keep all my photo files in a Dropbox and then save the Dropbox contents back to a removable hard drive (well, 3 of them, actually), just to ensure my photos are not ever lost. Plus I back up the Mac using Time Machine, also to a removable hard drive. It gets complicated but it works. Julie, glad you’ve found a solution that works for you! SSDs are indeed so much faster than HDDs – it is not even comparable! Jose, thank you for your feedback. Unfortunately, I do not have a video on how to build a machine step by step. I thought about doing it, but then realized that there are so many videos on YouTube on how to do it, that it would not be necessary. If you search on YouTube, you will find plenty of reference videos that have a lot of detail, including specific instructions for booting from an M.2 device. I hope the beginning of summer finds you well. Thoroughly enjoy your articles and reading about your trips. Your disappointment at Yellowstone saddened me, and I shared it with my wife. After the wonderful Workshop I attended with you in Colorado last year, I decided to build the computer your articles detailed. With the encouragement of Steve, one of the other participants at the workshop, I dove into it. With the help of a local PC shop, the project was finished last January, and I had in my possession the PC of my dreams. It screamed through stacking and panoramas like a hot knife through butter. Repeated attempts to boot the PC were a failure, and my PC shop tried switching it into the 2nd M.2 slot on my Gigabyte Z170X Gaming 7 MB also to no avail. The technician who helped me finish my machine had an identical MB so he removed my Samsung 950PRO 512 M.2 NVME SSD, and inserted into his MB, and it would not boot. I contacted Samsung and my SSD, still under warranty, is now taking a trip via UPS to Samsung headquarters. I was told that these SSDs are extremely reliable, so I guess bad luck for me. Have you or any of your readers heard of a similar event where a relatively new 950 PRO SSD failed? I am going through withdrawal for the last week. I still love my new setup. One in a million shot doc( I hope). Paul, great to hear from you again my friend! Hope things are well! Please let us know how it goes after the trip to Samsung – hope you can get the issues resolved in a timely manner. Other than going through withdrawal symptoms from not having my pc, everything is well here. In regards to the cooling capacity, I bought the Cooler HAF 942 Tower that you mentioned in the article, and additionally, I purchased a Noctua NH-U14S CPU cooler. With that cooler and the additional fans in the Tower , I can only assume I had adequate cooling. The few times I checked the internal temperature, it was never close to overheating, but please do not ask me now what those temps were. I do not play any games on the PC, and very rarely do any stacking or panaromas, and certainly nothing that might over tax the unit. Additionally, the event occurred while I was asleep, when the computer was just sleeping as well. I will be sure to make sure that all the fans are working properly, when I get the SSD back and reinstalled. I know Samsung received the SSD yesterday, and I have to resist the urge to call them today, to find out if they have any feedback for me. I will definitely keep you informed. Hope you and your family stay well. Have a great fourth of July. I was going to recommend Piriform’s Speccy to check on the temp, but it appears that it doesn’t show a temp for SSDs. However, it does show the temp for many other devices, and it might be good to see how those are doing. I have waited patiently for your update on the Samsung 950 PRO M.2. How quick was the turnaround from Samsung? What did they do? Are you back up & running? Any other helpful hints for the rest of us on this product? The big advantage with NVMe is the removal of the SATA bottleneck. There are also PCIe NBMe solutions. I am using one from Intel. Fact: Not all motherboards support that kind of m.2 speeds. Fact: you can install lightroom in your ssd drive and only store your catalog there….and use a HUGE hdd to store the raw files and you won’t feel so much difference in speed comparing to storing all your pictures in your really expensive storage. To open 30mb files you use the sequencial speed….5x in sequencial read performance is not a big deal opening a small 30mb file. Buying a 1tb m.2 ssd right of the bat is the best way to burn money. Fact: not everyone can afford an m.2 ssd, photographers should spend most of their money in lenses to get better images and better results. My 2 cents I think that photographers shouldn’t write about things that they do not fully understand…. Sherman you are right too. I have two ssds and two spin drives on my desktop. I still have my catalog on one of the spin drives. 7200 rpm seems to still be fine with my LR and PS. But it is good to know that I can put my catalog on the SSD and enjoy some speed change. On my laptop, I do put the catalog on the M2. I have and external 2 gig spinning drive for all the picture files. But I would give Nasim more credit for his PC knowledge. Jay, that’s actually my recommended solution for most photographers – either an SSD or a PCIe flash drive for catalogs and a large capacity volume for photo storage. It is a proven solution and I have been using it for the past 5+ years. Works for me….I have a 1TB SSD and 3 x 4TB SATA 7200 drives in my MacPro (old tower) and it contimues to deliver reliably, if not quite as fast, as the latest and greatest. Perhaps a bit creaky for a busy pro, but still perfectly fine for an enthusiastic amateur. Unfortunately my 8 year old Eizo monitor finally quietly died last week and I am sitting here looking at a new EIZO CG318-4K still in its box…. 4K + 10bit colour here I come. Betty, you might want to look into your graphics card first – not all GPUs can handle 4K output reliably. Looks like you have a very solid machine with plenty of fast storage. Nasim, I did that a while back with this eventuality in mind and also to improve performance overall. I installed an NVIDIA Quadro K5000 for Mac and increased RAM to the 32GB limit, which I believe is about as good as it gets on my old MacPro. Also, upgraded from Mavericks to El Capitan. So with El Capitan, Quadro K5000, Display Port1.2 and Eizo CG318-4K, I should be good to go. Unless I have missed something? The one thing I can’t upgrade (as far as I know) is the Intel 2 x 3GHz Quad core processor (early 2008!) which is showing its age now. Any suggestions from you, or any Mac genius out there, about how to improve my system further (short of scrapping it and getting a new one!) would be gratefully received. Nasim or whoever wants to chime in– so if I move my catalog over to my SSD off of my hard drive, how do I point the catalog to the pictures that remain on the hard drive? Without having to do every folder individually? Jay, if you are just moving the catalog without moving photos, you do not need to point anything. However, if you move your photos too, then you might want to click on any of your folders to reveal the parent folder. Then you can right click on the parent folder and locate it where you moved it. If your photos are scattered everywhere, I highly recommend that you organize your images – see this article for details: how to organize images in Lightroom. We cover this in depth in our upcoming video as well, if you would like to follow the video tutorial instead. Sherman, based on your comment, it looks like you have not read the article. Nasim recommends to go with an SSD or NVMe drive for the catalog, and a larger HDD for photographs. As for Intel PCIe being faster, that’s not necessarily true for all load types. In some benchmarks, Samsung Pro 950 M.2 comes out on top. William, always great to hear from you my friend! I am not offended at all by what Sherman wrote – I posted by response to him. Indeed it looks like he has not read the article, because some of the points he brought up are not contradicting the content of the article. Perhaps he meant to add that on top of what has been already written. Let’s be nicer to each other. If you don’t mind, I will remove the last sentence from your comment, as I do not want to see any personal attacks. Sherman, thank you for your feedback. I think you wrote your comment based on the image posted on the article, without reading what I wrote in the article. I never said anything in the article that contradict your facts, but I do have a thing or two to say about your comment. First of all, Intel PCIe SSD is NOT better than M.2 under every load to claim that it is “faster”. Look at the benchmarks and see for yourself – it is only better for write speeds under specific types of loads. For random write IO, it can certainly be up to 2x faster, but photographers in particular would not benefit from it for the most part. Your third fact is something I specifically addressed in the article in the third paragraph (if you had a chance to read it), where I recommended the use of a fast drive to store a catalog and a slower, larger capacity HDD for storing photos. And your last fact has nothing to do with the article, as each person’s budget and needs vary greatly. If someone can easily afford buying a 1 TB PCIe drive, that would not be my concern. And to wrap things up, specifically regarding your very last sentence, I have spent 20 years in the IT field and I have built everything from machines to large enterprise datacenters with petabytes of storage, so I know a thing or two about storage to hopefully be able to qualify writing about it. But I appreciate your concerns, your feedback and your criticism – I can see why you would have such a point of view, since most photographers are not well-versed in this area. The HDD can be bought much faster. 1TB-platter 7200rpm drives score 160+ MB/s sequential. The big improvement with a SATA-SSD is the random read/write; the 4K results in the posted bench. NVME SSD’s improves on that, especially with high que-dephts (4K Q32). The PCI-e bus can be much bigger than the SATA-600 limit. But depending on what exactly motherboard and SSD you have, you might not get PCIe 3.0 x4 (4 GB /s), but perhaps only PCIe 2.0 x2 (1GB/s). The improvements SATA SSD > PCIe SSD are only marginal, the biggest gain was the random read/write performance when going from HDD to SSD. Also note that some people who build or order a self-build system have their SATA ports running at IDE mode instead of AHCI..
Coen, thank you for your valuable feedback – it is always great to hear from you in such topics, since you are much more well-versed than me in computers. Great to know about 1 TB platters scoring so high on sequential writes, but the big question is – can much larger capacity HDDs score around that figure? For my yearly catalog, a 1 TB volume would be limiting, since I have big photo storage needs. In fact, even 2 TB is limiting right now with my enterprise-class WD 7200 RPM drives, since I now have a lot of video content. I am seriously considering getting a pair of 8 TB drives to replace my existing 2 TB RAID 1 volume. As always, an interesting topic Nasim! For anyone reading this who cannot afford to build/buy a new computer I thought to share that my computer is an 8 year old Dell desktop running Win 10. After reading about SSD versus a spinning drive I decided to buy a Samsung 850 EVO 500 GB SSD. I finally managed to copy everything from my spinning drive to the SSD and then installed the SSD. So, what happened (? ), … my 8 year old Dell refused to boot up. After much frustration I learned about AHCI versus IDE. My BIOS would not upgrade, so (with more frustration, disappointment etc)….I found some AHCI drivers on a Lenovo web site and installed them, and presto… my 8 year old desktop booted up with new life. It boots up much faster and my image processing software comes on the screen in a few seconds compared to endless waiting in the past. However, just to be clear, my images are stored on an external USB hard drive which is a bit of a bottle neck but it does work. Ronald, thank you for your feedback! That’s an excellent point regarding using a new drive on an older system, as some things might not be compatible. It is a good thing that you were able to find a solution! Great topics Nasim, thanks for the work you put into these engaging subjects. Much appreciated. The bottleneck people are experiencing is not really about hard drives. It is about RAM. About two months before you built your latest computer, Nasim, my own computer died and I had to rebuild just before Skylake came out. I remember that when you wrote your article describing your build, it was identical to what I had built right down to the brand of tower case, though mine was an older Cooler Master than yours. That was really fun to see, btw. The one difference was in the amount of RAM. I used 32gb of RAM as opposed to your 16gb. In my previous Ivy Bridge build I had used 16gb RAM and thought it was great. But the difference from 16 to 32 is amazing. My computer flies. I have a 1Tb SSD drive with my OS on it, and a HGST 7200rpm 3TB spinney drive as my storage drive. When I do my photo backup I can upload 10gb in about 45 seconds. When I do my photo editing all edits are instant. This is due to the massive amount of RAM I have. I strongly recommend 32gb of RAM for photographers who love speed, and I also recommend the HGST as the best and fastest spinney (HDD) drives out there right now. SSD drives are terrific, but very expensive in large sizes. The setup I have has really worked out well. In short, the best bang for your buck is to invest in RAM even before you decide on what kind of drives you want. Elaine, that’s a good point too, which is why I stated at the end of the article that storage is not the only way to increase post-processing speed – there are many other factors, including total RAM and its speed. On my current setup, I have 64 GB of RAM and the beast just flies with everything I throw at it. However, my recent bad experience with Adobe’s updates proved that even 64 GB of RAM can be eaten by badly designed software (thanks to Adobe’s memory leaks!). While exporting video footage for our second video, I saw that Media Manager and AfterEffects were eating up all of my available RAM! I wonder what it would look like if I did it on my other PC, where I have 32 GB of RAM – it would probably crash. I hope Adobe addresses these issues, since the latest update for Premiere Pro, AfterEffects and Media Manager are a big disaster. On a side note, HGST drives are indeed quite reliable. From what I remember, a large datacenter posted their statistics, in which they showed that HGST was the most reliable brand between all hard disk drive manufacturers. My MacPro is quite old now so it’s the processor which is the bottleneck, but when I put in an SSD main drive and maxxed out the RAM to 32GB it made a very big difference to performance. However, when I look at machines like Nasim’s, mine looks a bit like a steam engine in the age of the jet. Although generally more RAM doesn’t hurt, the whole statement is incorrect. The increase in speed you notice (especially while editing) has everything to do with the upgraded processor and chipset (Haswell, I guess), and nothing to do with the increased amount of RAM. Pull out 3 of the 4 RAM sticks (leaving with just 8GB) and the speed will be exactly the same – of course, given your photo editing and exporting is the only resource intensive processes you are running at the time of the test. You need really “leaky” large scale video editing and 50 image panoramas running at the same time to find that you need 32GB or more. I see you are using CrystalDiskMark. Because of the reports that the distribution is loaded with adware I have not downloaded it. Is there a way to get a clean copy? David, I downloaded the ZIP file that contains only the executable. I try not to use self-installers. Many thanks Nassim for a great article. I would agree with what has already been pointed out that the advantages of non-mechanical drives comes from the random low queue depth read/write speed (this is how the OS often ‘interacts’ with the data stored in the drive) until you copy/paste a file this is when seq read/write speed matters). However, I would disagree with some of the comments that the difference isn’t noticeable (that is, between SSD and NVMe drives) in workflow: I think as more photographers capture and process uncompressed 4k videos or those pesky D810 RAWs it is indeed noticble. Beside there is no harm in having an element of future proofing to your hardware. The caveat in the conclusion is indeed very sensible. Hassan, thank you for your feedback! Yes, I have noted that many of the readers are right regarding the main differences at random reads. I personally went with the NVMe M.2, because I was building a new PC and I wanted to get something faster than SSD, since I now do a lot of video, for which seq read speed is indeed important. In addition, if one does a lot of work in Photoshop involving a lot of layers and large files, NVMe flash can be of a big benefit. Good point on choosing the storage for the future – why not invest in the future? Great point on the M.2 – the graph makes it look like M.2 is a drive type, but I never stated that in the article. M.2 has been available for many years, especially on laptops. It would have been interesting to have also an M.2 SSD that was not an NVMe. In my case, I have an ASUS Maximus VIII Hero, and all that I read about the M.2 connection expressed some concern that without certain drivers, etc. that it might not boot or work properly. So I didn’t choose to go that way. I use Lightroom CC. Previously, the best way to boost the speed was increased RAM, and then more processor cores. Couldn’t afford the $,1000 just for an 8 core processor. Then Adobe came out with an upgrade that made use of certain GPUs to improve performance. Unfortunately, even though I have one of the recommended GPUs (ASUS GTX 760), I haven’t been able to make it work. LR just stops working altogether. After installing the latest GPU driver, LR seemed to work for awhile. After selecting GPU support to increase performance in the LR Preferences, it works in Library mode, but when I switch to Develop mode, it just hangs, and goes dim. Oh well, using an Intel i7-6700K, 32GB RAM, 512GB SSD for the catalog, it does pretty well. An M.2 SSD that uses SATA doesn’t give any different results than the same thing in a 2.5″ form factor. Excellent point Coen, it would not make much sense to compare a SATA M.2 to an NVMe M.2 – the difference in night and day. Nasim, On my MoBo, you can set your M.2 device to either SATA or PCIe3. If you set it to SATA, you disable SATA-1 & SATA-2 ports. SO, if your goal is to use the M.2 port to gain additional SSD drives, you may be disappointed. Also, if you set the M.2 device to PCIe mode, you will share the channel that has the graphics card. So if you are involved in an application that heavily uses that channel, you may not get the added benefit for which that you are hoping. So, depending on your MoBo, and other configurations, NVMe may not actually give you as much performance benefit from Lightroom as a simple test that just measures reads, writes, and random access would suggest. I look forward to your tests actually using Lightroom. Charlie, it is pretty disappointing to see how poorly the GPU acceleration is implemented in Lightroom. I have seen so many issues with it, especially on laptops, where it is better to disable GPU acceleration completely…And on my fast desktop, I still have crazy slowdown issues with the adjustment brush – it is disappointing how bad such features are implemented in Lightroom. I never really noticed a severe performance impact until I started using the Nikon D810. Prior to that, Lightroom chewed through the D700 and D4s images pretty well coming off of a dedicated SSD. That’s the experience of many people who thought their old computers were fast enough for 36 MP files. I have personally seen photographers return their D800s and D810s just because they could not deal with the slower processing speed. I have been saying, since 5400 RPM rotational IDE drives were commonplace, that the surest way to increase the speed of a computer (besides adding RAM) is to get a faster disk. From a user experience perspective it has a huge impact. I run an array at work with 20TB of enterprise flash disk so I am coming from a place of knowledge. Obviously this isn’t apples to apples but your standard low cost solid state drives that you can buy on Amazon are many times faster in total I/OPS (input/output operations) than the old FibreChannel 15K rotational speed drives which used to be the gold standard. Plus, the failure rate is like 1.5% where a rotating SATA disk is more like 5%, in my world this is a massive difference. It is the difference between replacing 10 drives in an array in a given year to like 2. Plus, I don’t think you mentioned, but rotating disk lose some ungodly amount of efficiency when they get past the 70% full mark. Solid state drives don’t have this issue because they literally never seek for a read or a write. OK, I am geeking out too much. Although I know nothing about computers, builds, etc, I appreciate your article and will save it for when I find someone to help me put together a system down here. That includes appreciation for your article on how to – build a computer for photography – posted earlier. Hi. I’m shopping for a laptop that will be used primarily for video and photo editing. It’ll be a PC (Windows 10) and I’ll mostly be using Adobe software (Photoshop, Premiere Pro, Lightroom, After Effects, Audition). Judging by the models I’ve been looking at and budget concerns, it looks like I will only have one SSD m.2 PCIe NVMe drive. The other drive will either be SSD m.2 SATA3 or a spinning 7200RPM drive. I also will have the option of hooking up external drives via USB 3.0 OR USB 3.1-C.
Now, from what I’ve read and been told — the best setup would be having three separate drives when working on a project. Drive 2: Data files: Lightroom catalog, Premiere Pro project files, etc. I’ve been reading some conflicting information as to what setup would be best, given my hard drive constraints. In other words, which drive should be the m.2 PCIe NVMe drive? Which should be the m.2 SATA III drive and which the external USB drive? Also, what sort of differences would I feel – say during video editing – if I were to say use m.2 SATA III for both Drive 1 and Drive 2, compared to the above setup? Is it just exporting speed? Or would I suddenly feel a lag, like things aren’t as slick during the actual editing? 1) What is the laptop that you are getting for that kind of money? I haven’t found one suitable at $2,800.00. 2) Another consideration is having a discreet GPU. Of course if you can get it to work with Lightroom…. 3) If I understand, your setup may be correct, if your BIOS will allow it. Also, if I understand, speed is more important for the catalog & the original file than it is for the export/output. Although that is important to. 4) You should at least have 4 physical cores in your processor. Some of Adobe software is core sensitive. I have been searching about what ssd I could use to upgrade my mac pro 6.1 (Late 2013) and I found this awesome ssd from Samsung (950 PRO M.2 SSD 512GB). I wonder if it is compatible with my computer. Please need help with this. Got what I want. Your screenshot reveals all post in few seconds. Thanks, NASIM MANSUROV and photographylife for this valuable post. Quick question when using Lightroom is their much of an advantage putting the LR Cat on the fast drive as well? It’s probably better to do the reverse – catalogue on the SSD and images on a SATA drive. And it’s more efficient to have the two on separate drives. currently have a Samsung 840 Evo 120gb in my laptop. Getting about 512 read and just a little slower in the write speeds with the turbo cache turned on. My laptop does not have a NVMe M.2 interface. And I am looking at the Samsung 960 Evo M.2 PCIE. So what am I am planning on doing is using a STARTECH SAT32M225 M.2 NGFF SSD to SATA Adapter Converter and installing it in my laptop. Will the SATA interface with the M.2 drive give me any performance enhancements at all? I do know it wont give me the maximum performance. I am fully aware. But could I expect any performance increase at all? Hi, bad news, you will NOT benefit from this combination, because SATA controller will cap the speeds, and I assume it would work like your 840, because that’s practical limit of SATA interface. I would wait and sell your current stuff, and buy regular PC, why? Most laptops with M.2 are NOT gen3 x4 slots, but slower, so even if you put in 960, you might get SATA speeds, or a bit faster. You must read the specs and make sure whatever you buy has M.2 gen3 x4 slot [or 2, that would be perfect]. If you have some in depth questions, I am an IT worker, I do this stuff on daily basis, test, fix, build, etc, so my opinion is based on many different configurations and specs, that means I am not biased towards anything, I only look at what a piece of tech can do. [email protected] < contact if you like. Which one is better got gaming …NVMe or PCIe/3D NAND . I have a NVMe M.2 at the moment that’s blazing fast but I am a little worried about how long it will last for gaming .